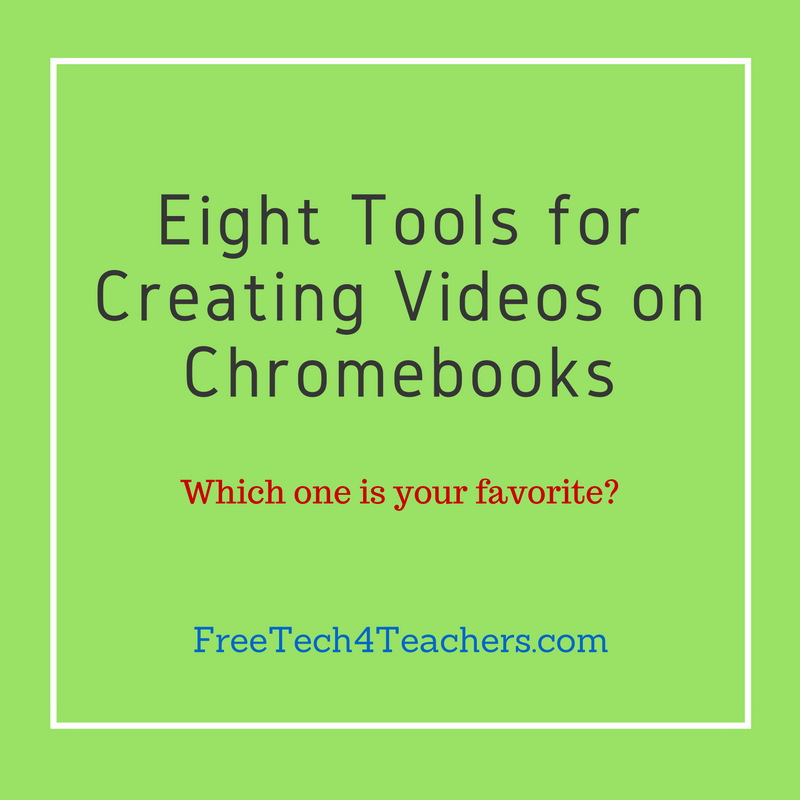 A couple of days ago Tony Vincent Tweeted my list of tools for creating videos on Chromebooks. That list was last updated in November. Tony's Tweet prompted me to update the list again. 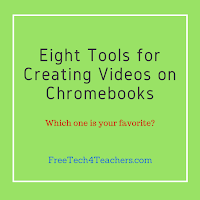 The notable differences between this list and the last one is that I've removed Wideo because that service no longer offers any free options for teachers or students. I've also added three new tools in Sharalike, CaptureCast, and Magisto. Adobe Spark is a suite of free tools for creating images, videos, and simple web pages. Key features of Adobe Spark's web app include an integrated Creative Commons image search tool, the option to download images as JPEGs, and the option to download your videos as MP4 files. In the video embedded below I demonstrate how to create images, web pages, and videos with Adobe Spark in your web browser. Sharalike is a good option to consider when you want to create an audio slideshow. To create an audio slideshow on Sharalike simply import some images from your computer, your Android device or from your iPad, drag them into the sequence in which you want them to appear, and then add some music. Sharalike offers a small collection of stock music that you can use or you can upload your own music. PowToon is a popular tool for creating animated videos online. PowToon provides a drag-and-drop editor for creating animated videos. The videos that you create feature digital paper cut-outs on a colorful background. Think of PowToon as an online tool for creating videos in the style made popular by Common Craft. PowToon provides drawings of people and objects that you can arrange on blank canvas. After adding your narration to the arrangement you can publish your video. Magisto is a video creation tool that allows you to quickly drag videos and images from your desktop and or Google Drive account to your Magisto account. After you've uploaded the media that you want mixed, select a theme and music for your video.From the video clips and images that you upload, Magisto will select the best portions to remix and blend together. Magisto creates your video after you've completed the steps of uploading media, selecting a theme, and choosing music. The final video is emailed to you. In addition to the web-based service Magisto offers a Chrome app, an Android app, and an iPad app. WeVideo offers the most features of any of the tools in this list. It is an online video creation tool that I have written about many times over the last few years. WeVideo offers templates that new users can follow to create their first videos. Advanced WeVideo users can skip the templates, use the full editor, and apply themes to their videos by choosing them from the themes menu in the editor. In the video editor you can upload your own media clips or use stock media clips to produce your video. WeVideo's Google Drive app allows you to save all of your video projects in your Google Drive account. WeVideo also offers an Android app and an iPhone app that students can use to capture images and video footage to add to their projects. Nimbus Screenshot is my favorite tool for creating screencast videos on Chromebooks. It is easy to install, includes customizable countdown timer, and offers multiple ways to save and share your videos. Screencasts recorded with Nimbus Screenshot can be saved to your local drive or to an online Nimbus account. I chose to save to my local drive then upload to my YouTube channel. You could also save to your local drive then share to Google Drive or another online storage service. Recording a video with the webcam on your Chromebook can be accomplished through the use of a free Chrome app called CaptureCast. CaptureCast, produced by Cattura Video, allows you to record the screen on your Chromebook as well as input from your webcam. To record a video with the webcam on your Chromebook open CaptureCast in your browser then allow it to access your webcam and microphone. You can specify how high of a resolution you would like to use to capture your video. You can also choose your audio quality. If you have an external microphone connected to your Chromebook, make sure that you have it enabled before you start recording. When you have finished recording in CaptureCast you can save your video on your Chromebook or upload it to YouTube, to Vimeo, or to Google Drive. Finally, YouTube offers some good video creation and editing tools that most people overlook. One of those tools allows you to combine video clips to make one longer video. You can combine your own videos and or use video clips from YouTube's gallery of Creative Commons licensed videos. So while your students aren't limited to just their videos, they also just can't grab any old video from YouTube, like this chart-topper, to include in their projects. You can learn more about how to use YouTube's overlooked features tomorrow in YouTube, It's Not Just Cats & Khan Academy.